I realised when I posted my review of the OVAs that I had never actually written my thoughts on the first season of One Punch Man – in fact, I decided not to because those OVAs were coming out and I thought I could write everything together. But that was six months ago and I forgot all about it. Well, I’ve posted my thoughts on the OVAs, so I’d better post about season one! One Punch Man has an interesting creation story, which really helps its success. It’s the kind of feel-good underdog success story that you can really get behind. A writer calling himself One started to publish a crudely-drawn webcomic about a superhero so strong that no matter how powerful his opponents, they can be beaten with one punch. Rather than looking incredibly cool, this hero is a rather ordinary-looking bald guy with a silly costume reminiscent of Anpanman with colours inverted, the Japanese title being a play on that classic children’s character. Not only is our caped hero Saitama goofy-looking, but he has a very detached, deadpan attitude to the world, speaking his mind and undercutting all the usual inflated rhetoric of comic book villains by using a single punch to destroy them. As a vehicle for bathos to undercut all of the clichés of a world where huge monsters and cheesy superheroes do battle, it works marvellously. I was a little sceptical when I heard the premise. Godzilla vs Bambi is never much fun. 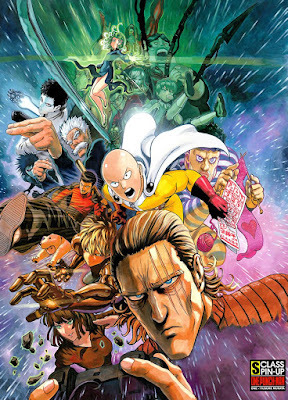 If Saitama overcomes all obstacles with one punch, what drama can there be? But this is where One’s writing makes a difference, and why, I presume, readers were hooked despite the terrible art (which has it has to be said vastly improved by this point) and the obvious concept. Rather than Saitama’s power, it is the world he is part of and the way he balances indifference and yearning to be recognised and appreciated that makes this series so compelling. One of the things that I like the most about One Punch Man is that in many ways it echoes HunterxHunter. One is not shy about this – some character designs are direct echoes, and one frontispiece had Saitama reading and praising HunterxHunter in Jump. The Hero Association in One Punch Man is very similar to the Hunter Association, with some very familiar dynamics. The real compelling drama of One Punch Man is the slow recognition of Saitama’s talents. He is first acknowledged by Genos, a rather adorably pure-hearted cyborg out for revenge and powerful enough to go right to the top of the Association. Saitama, meanwhile, is held down by not being the brightest bulb, despite what his shiny head might make you think, and enters the association near the bottom – and is given the rather unfortunate name of ‘Caped Baldy’. This premise is what got me hooked, but it’s the ensemble cast of S-Class heroes that took me over the boundary to loving this series. Each of them revealed thus far is very interesting and interacts with Saitama in a very amusing way, be it tetchy master telepath Tatsumaki or the wonderfully misleading King. I’m delighted that One Punch Man is so popular and will soon be having its second season. It’s funny, it does smart things with its simple concept, and above all, it’s likeable. I want more!